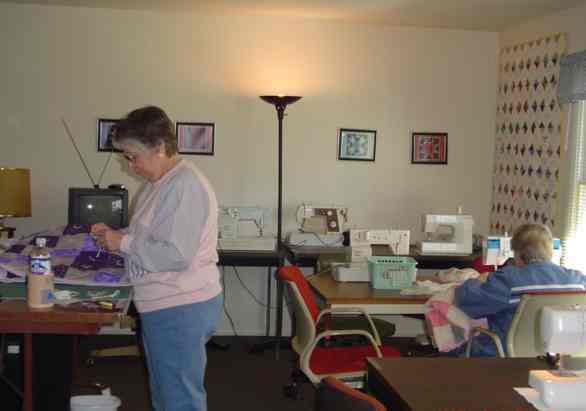 While working at Edward’s Sewing Center in February, 2004, Peggy Albertson, former Chapter Coordinator, became involved in Project Linus’ National Make-A-Blanket Day. When she discovered there was no local Project Linus chapter, she was very disappointed. Sitting in church the following day, Peggy started to think about how blessed she was to have healthy children and a happy, healthy granddaughter. She was so very grateful, (and still is), that her family has not had the need for a security blanket. At that moment, she received a very strong call from God to start a local Linus chapter. Monday Morning Peggy went to the Project Linus website to get more information on how to start a chapter. She applied, and on April 13, 2004 received an email that she had been approved to begin one in this area. So there we were… Except after 11 years as chapter coordinator and countless hours of dedicated work, Peggy decided that changes in her life required her to step down and turn the reins over to someone else. As her sister, I have been involved with the chapter since its inception and was able to step in and take over as Chapter Coordinator. Peggy will stay involved as a blanketeer and as my consultant, and together we will make sure our chapter continues to flourish and serve the needs of our community. Our Project Linus Chapter House is located in the Parsonage of the Salem United Church of Christ, 2401 Lake Avenue. The church is located at the corner of Lake Avenue and Carew Street and the parsonage sits at the west end of the church parking lot. We have been very fortunate to have this home donated for our use in making and storing blankets for our community. The rent is donated, but we are asked to pay the utilities. Since we are volunteers and non-profit, we have not been able to contribute to the utilities. If you are interested in helping with that expense, please contact the Chapter Coordinator, Joyce Pickett. on Lake Ave. for the use of the house. On Wednesdays, from 11 a.m. to 3 p.m., we meet at the workshop to count, inspect, repair, label, sort, categorize and prepare blankets to be delivered to the many facilities in our community. Please feel free to visit us at any time. Stop in and we will have plenty for you to do. Stay an hour, stay all day – but bring your lunch! We have all the comforts of home: refrigerator, microwave, sergers, sewing machines and cutting tables. Supplies for sewing, knitting, crocheting and quilting. You don’t have to be an expert. Anyone can help and all “blanketeers” are willing to help or teach you new skills. 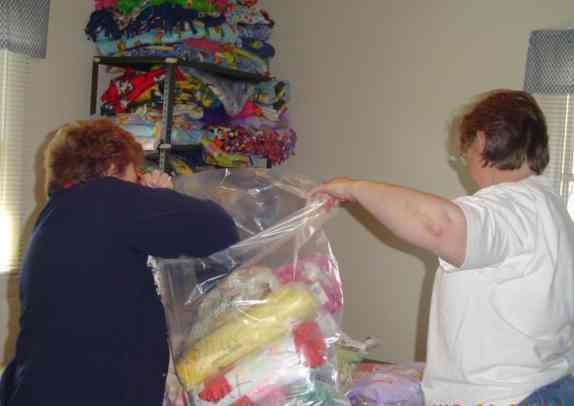 Blankets are getting bagged and ready to deliver to one of our many facilities. 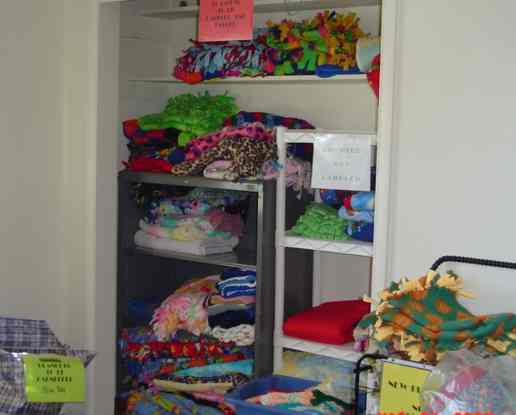 Most of our facilities require that each blanket be wrapped individually. Lots of work goes into the preparation of blankets before they are sent out. Here, blankets are waiting to either be counted, inspected or to have the label sewn on. 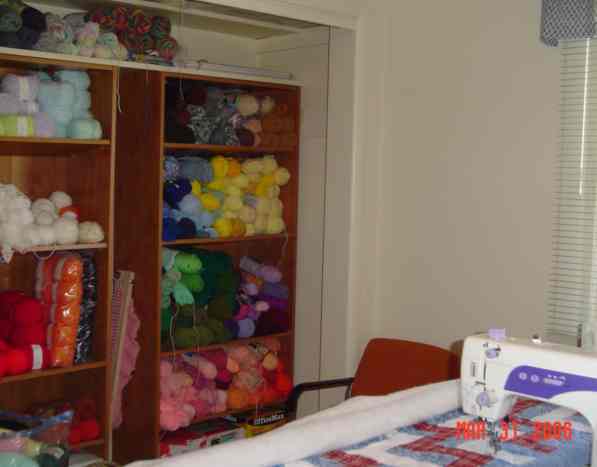 Donated yarn, quilting machine and frame are all available at the Project Linus house to work on blankets. Several donated sewing machines are set up and ready to be used to sew on labels. go to the Questions/Comments tab. A special “blankie” has helped Laura, 3, get through more than two years of intensive chemotherapy. She takes it to the hospital with her when she goes for treatment. When she was first diagnosed, 97 percent of her bone marrow contained cancerous cells. Although chemotherapy has helped eradicate the cancer, she has had to endure nausea, high fevers and the loss of her hair. An allergic reaction at one point caused her to lose vital signs. “She doesn’t understand what cancer means,” her mother says. “She’s a very joyous and happy person, very curious.” Her mother hopes Laura can start preschool next spring. After reading the article, Karen Loucks decided to provide homemade security blankets to Denver’s Rocky Mountain Children’s Cancer Center, and Project Linus was born. About 250 chapters of Project Linus exist in the United States with over 5 million blankets delivered worldwide since 1998. SECOND Provide a rewarding and fun service opportunity for interested individuals and groups in local communities, for the benefit of children. Visit the Project Linus Website www.projectlinus.org.